On 22 February, armed men of Jatiyatabadi Chhatra Dal abducted Khairul Islam from in front of Chittagong Mimi Super Market and killed him viciously at the front of Battery Lane. 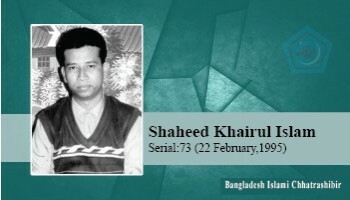 Shaheed Khairul Islam was an associate of the organization and student of Darul Ulum Aliya Madrassa Fazil, second year. Shahid Khairul's house is at Chokoria in Cox's Bazar.